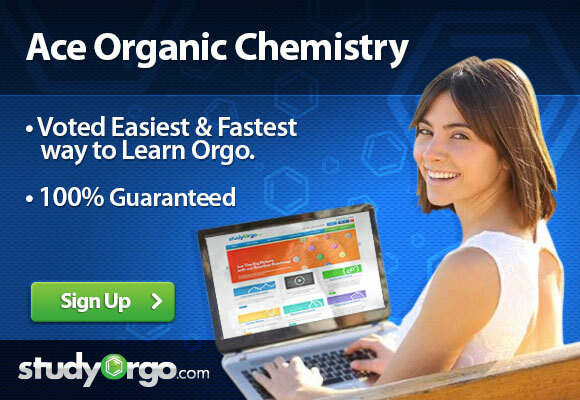 One of the most common difficulties in Orgo 2 is the concept of sigmatropic and electrocyclic reactions. Both of these reactions involve conjugated pi bond systems, which are multiple, adjacent carbon atoms with connected pi bond orbitals. The Greek word sigmatropic literally means “sigma(bond) changing”, thus when presented with a conjugated pi bond molecule where bonds are broken and formed, the driving force of this reaction is carried out by moving the pi-bond system around the molecule. Two types of sigmatropic reactions are common for this class. First is the Cope rearrangement. This is also referred to as a [3,3] sigmatropic rearrangement. Many students struggle with with nomenclature, especially since the [x,x] nomenclature is most often presented on tests. What does it exactly does [3,3] or [1,5] mean? Lets look at a few examples. Below is a typical Cope Rearrangement with [3,3] sigmatropic rearrangement. We see that the reactant has 2 pi bond (or 4 pi electrons) in a pseudo-cyclic arrangement. Right now, each alkene has one substituent that is not an H. if we move the pi-electrons around the ring, we can form a resonance structure (middle molecule) which is a complete ring. The product is to break the sigma bond in red and form a sigma bond in green. But why are there three arrows (meaning 6 electrons) involved in the mechanism? This is because while in the reactant the red bond electrons are sigma, when the molecule rearranges, they will be used to form a new pi bond, while the reactant pi bonds will donate electrons to become the green sigma bond. Now one of the alkenes has two substituents, which is more favorable and drives the reaction to the right. Identify what bond will break and what bond will form. Draw an imaginary plane that intersects these two bonds. Placing them together, we can see that a [3,3] sigmatropic rearrangement means a new bond is formed between atom 3 above and atom 3 below the imaginary plane. The same is true for non-carbon atoms in the ring. The second example looks at a [1,5] sigmatropic rearrangement of hydrogen (also called [1,5] hydride shift). 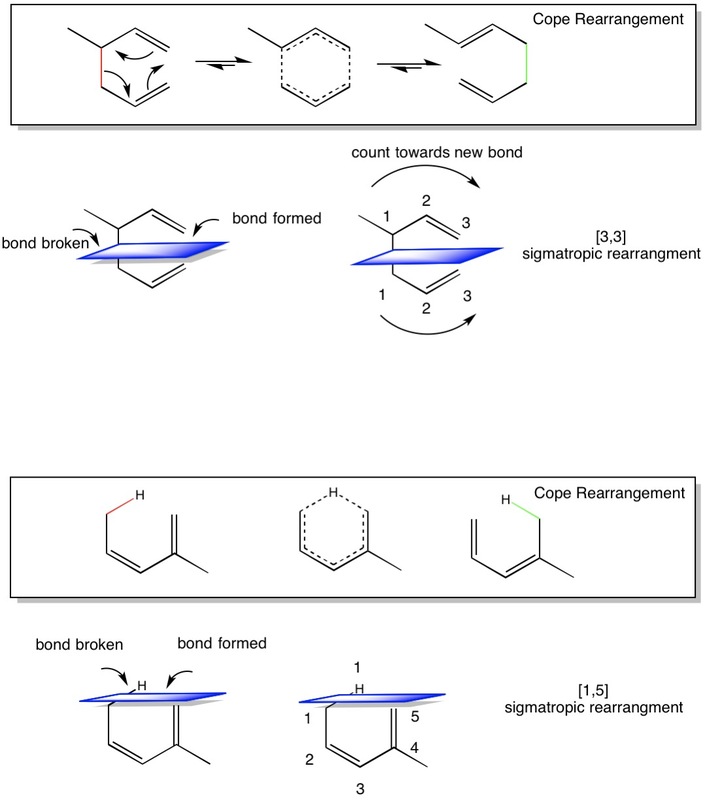 Placing them together, we can see that a [1,5] sigmatropic rearrangement means a new bond is formed between atom 1 above and atom 5 below the imaginary plane. In cases where oxygen is present as an ether, the name of the reaction is changed to Claisen Rearrangement. However, the mechanism is the same. The aldehyde or ketone product is almost alway preferred to the ether reactant shown here. Another question that is typically a major stumbling block of students is the rules for choosing reaction conditions for electrocyclic reactions. This refers to the rotation of pi bonds to form new sigma bonds or the rotation of sigma bonds to form new pi bonds. The two atoms can rotate their orbitals in such a way that they rotate in the same directions (conrotory), which gives trans- orientation, or in opposite directions (disrotory), which gives cis- orientation. The main point is that the substituents on the these atoms will be in different stereochemical arrangements. 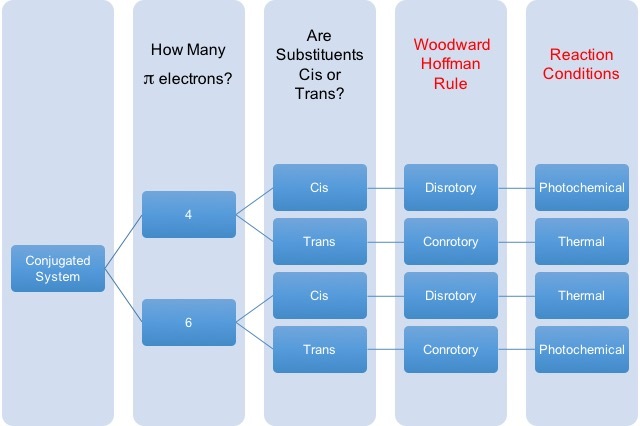 When a chemist wants to choose the correct stereochemical outcome of the molecule, you have to choose the right conditions to get the substituents of these electrocyclic atoms in cis- or trans- to each other. Below is a convenient table to help you identify the right condition for the reaction presented to you.